We are on vacation in California this week!!! My husband had a work conference in Vegas, and since he was already going to be out west we decided to take a holiday on that side of the country. I flew out to Los Angeles on Thursday where he joined me Friday evening after his convention. I have a very dear friend who recently moved out here, and we are visiting her while we are out this way. I have to say so far, everything has been amazing! She has taken us to delicious restaurants and we have seen some beautiful places. The only bummer is that I am sick. I have some bug that just cannot shake. I went to the doctor before I left and got some antibiotics, and I honestly was feeling better before I left. But the funk is back and it is worse than before! However, I refuse to let a little bug get in the way of my fun. I am pushing through it. Yesterday we took it pretty easy, and took some scenic drives through Malibu up Old Canyon Road, Mullholland Drive, and Topanga Canyon. It was beautiful, and easy to ignore how bad I was feeling. 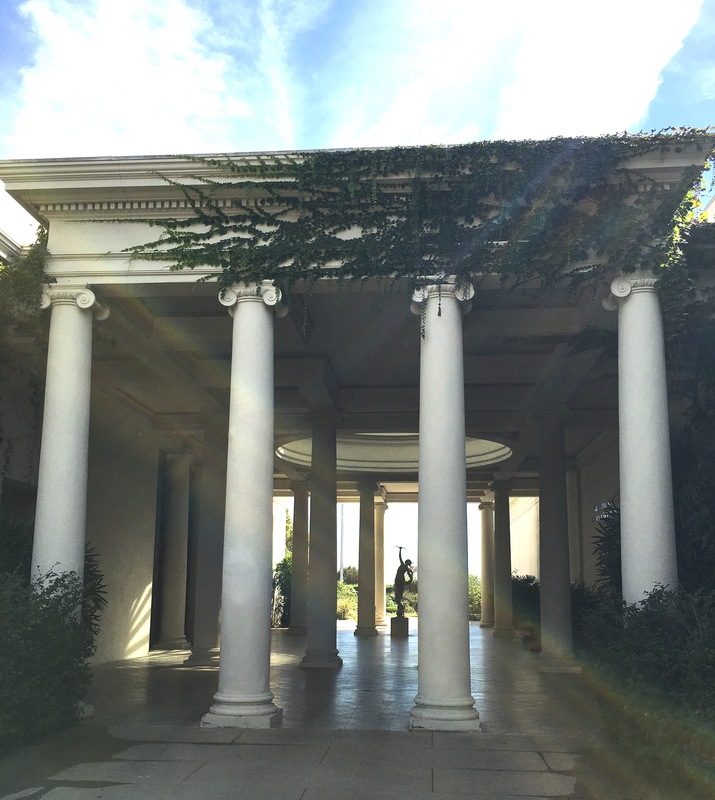 But, on Friday before my husband flew in, and before I started feeling worse, my friend took me to Huntington Library. This is not an ordinary municipal library by any means. It was the private ranch of Mr. Huntington, where he retired from the railroad industry to focus on landscaping and collecting books and art. What a life, right? Surrounding yourself with rare, exotic, and expensive works of art, literature, and botanical specimens. Nobel laureates and academics use the library for research, and there is a collection of some pretty rare manuscripts and other works. They also have 4 different art galleries on the property as well with very impressive collections of European and American works. Then there are over 120 acres of gorgeous gardens! The architecture here is pretty good too! 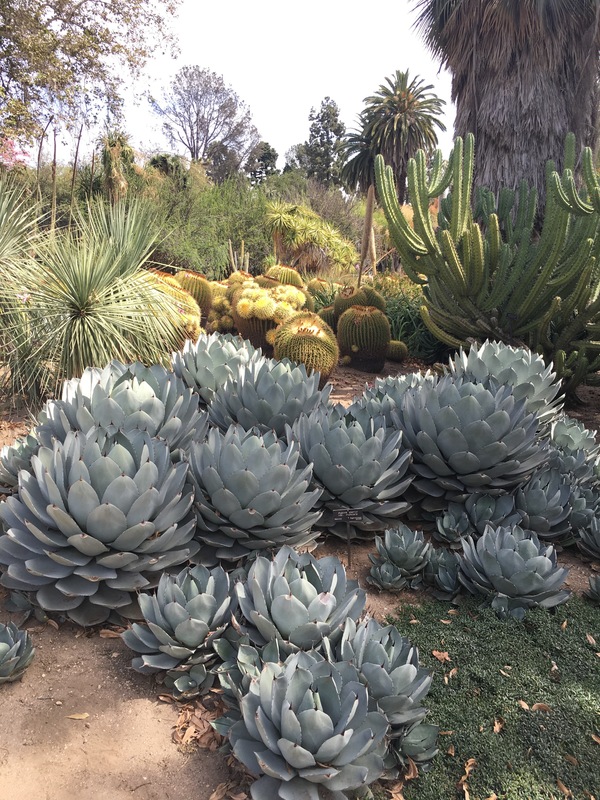 My friend and I spent the day touring the gardens, and we still didn’t explore the entire property! There is so much to see and do at this place, and I don’t see how you could ever knock everything out in just one day trip. If you are ever in LA, I highly recommend you go. I knew it would be pretty, but this place exceeded every expectation I had. Everything was so strikingly beautiful, and I was truly blown away. 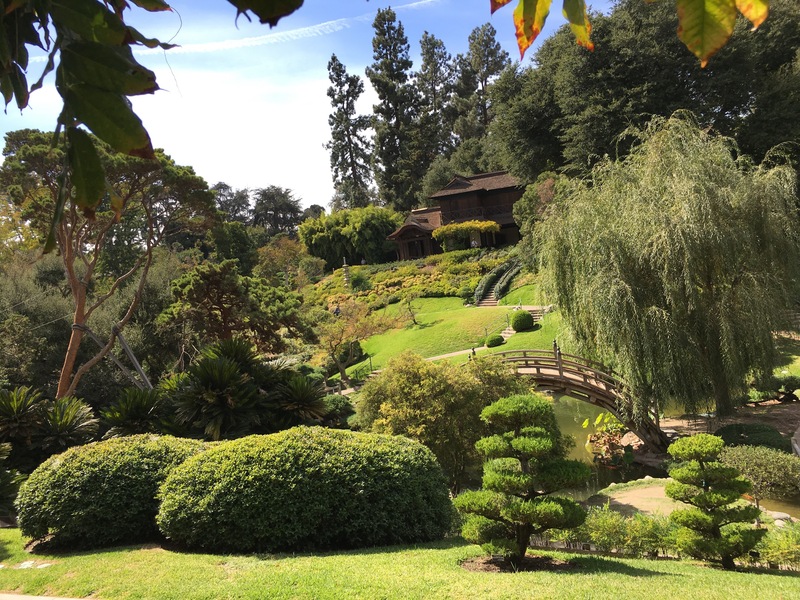 There is a palm garden, desert garden, lily ponds, jungle garden, herb garden, rose garden, Chinese garden, Japanese garden, and an Australia garden to name a few. All of them are breathtakingly beautiful and smell divine. I am pretty sure we spent at least an hour in the rose garden huffing all the different roses. Same thing in the herb garden. It was so fun, and very inspiring. 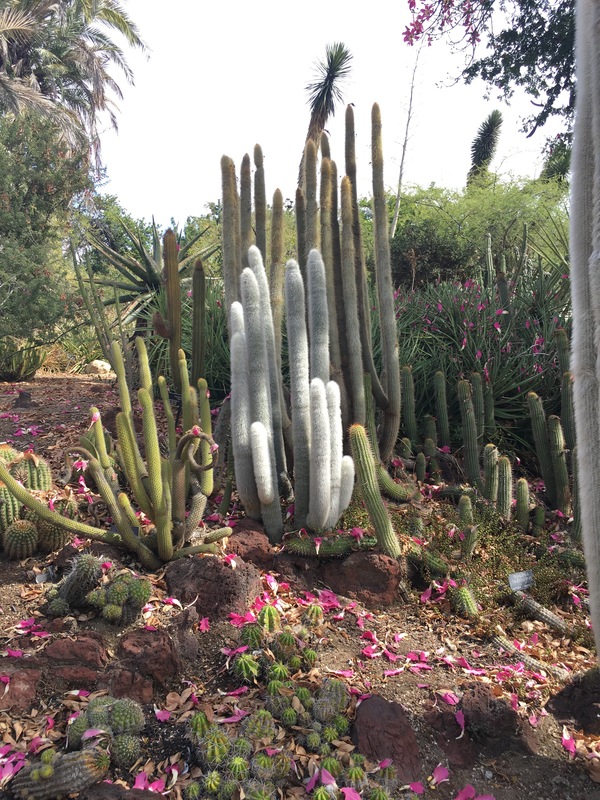 I loved all the layers of color and texture in the desert garden. 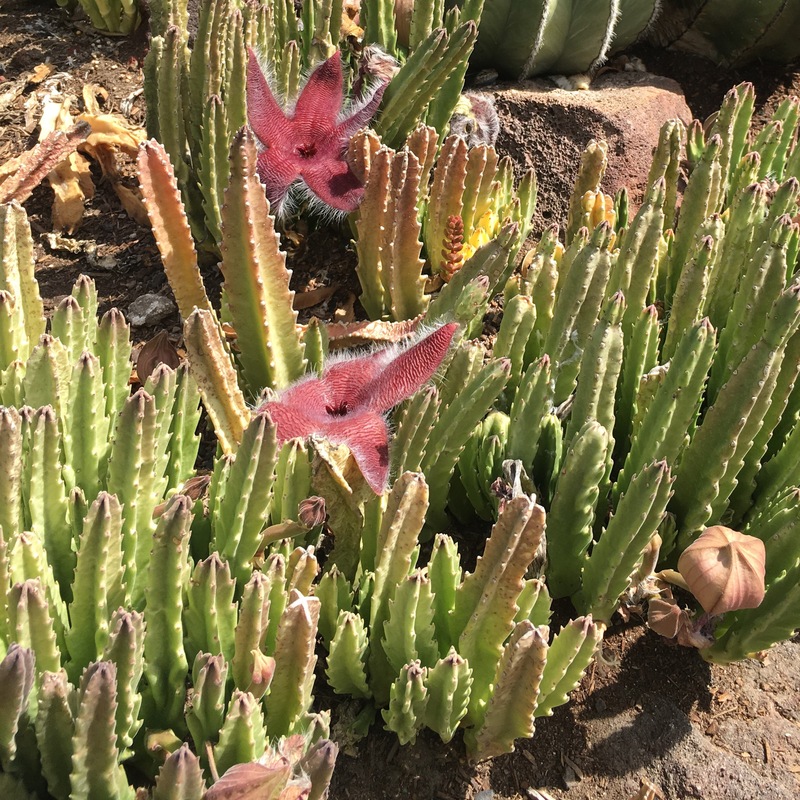 These cactus blooms remind me of starfish! 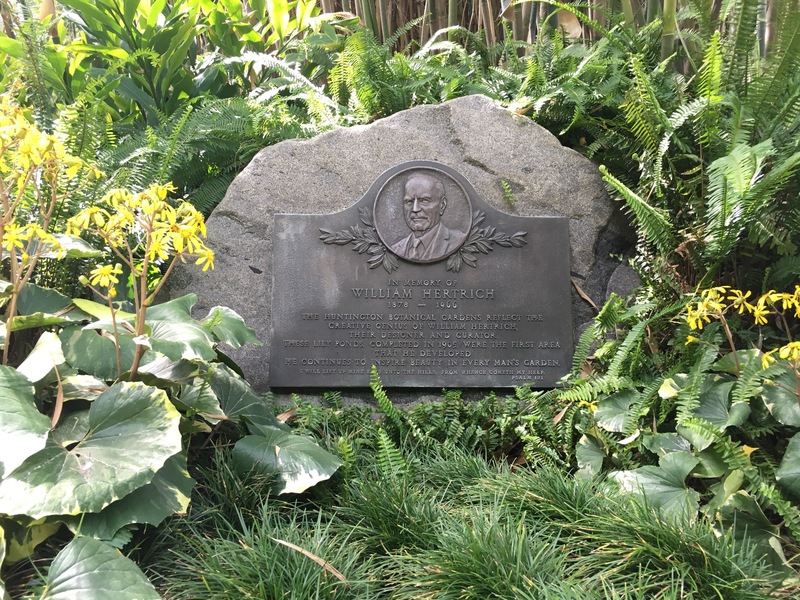 The gardens are the work of William Hertrich, and there is a small monument honoring him in the Lily ponds garden. I cannot even imagine how one would even know where to begin to start with a project like this. I wonder if he knew or had the vision of what it looks like now when he started. 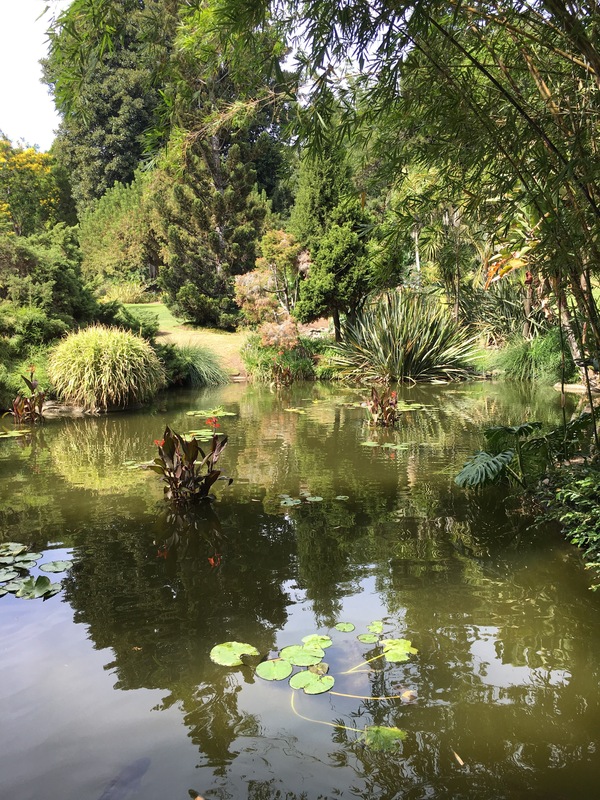 Over 100 years after he completed the Lily pond gardens, the grounds at the Huntington Library are still an incredibly inspiring place. I am now convinced that I must have a rose garden and herb garden at my house. Oh and a succulent/desert garden. Tis a shame I live on a shady lot! Oh well, my sister has a sunny yard, perhaps she will let me take over her yard and plant all the things that won’t grow at my house. Monument to William Hertrich, the creative genius behind the landscape. Petals from a nearby tree sprinkled on the ground in the desert garden. The succulents are my favorite plants! Thanks for sharing.